One of the most artistically gifted of the younger generation of bamboo artists, Morigami’s parents are both bamboo artisans who work commercially. He enrolled at the Beppu Occupational School in 1979, and he already had a solid foundation in bamboo. His graduation was fortuitously timed. The Japanese economy was strong and his gentle, delicate designs had broad appeal for decorating modern apartments. For a time, he had so many department store orders that he employed several young assistants. 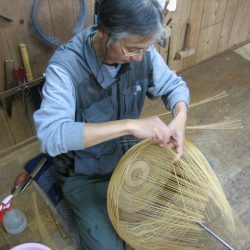 A fine designer and craftsman, Morigami is credited with introducing a new style of bamboo basketry to the Beppu market. As a young artist he submitted his work to Nitten, the Japan Fine Arts Association, in a highly unusual process, was accepted without having to advance through the interim stages. The resentment that ensued from more senior artists contributed to his decision to end his involvement with Japan’s public exhibition system for many years. By the time his work was introduced to collectors in the United States, he was so consumed with earning a living for his family that he had given up creating new artwork. Today, Western interest has breathed new life into his career. Since 2005, when his work was again accepted in Nitten, the artist has enjoyed renewed success in Japan and abroad. He is working on a series of topography-themed sculpture made in a style of hexagonal plaiting that is a radical departure from the traditional. Morigami’s pieces are part of collections at the Metropolitan Museum of Art, the Denver Art Museum, and the Museum of Art and Design in New York City. In 2004, he was a finalist for the prestigious Cotsen Prize. It has been over 40 years since I started working with bamboo professionally. Bamboo was always around me as a child, as both my parents and grand-parents worked with it. I remember making my own bamboo toys and playing with them when I was young. Perhaps that fun experience of playing with bamboo led me to decide to become a professional bamboo artist. At age nineteen, while still assisting with my parents’ bamboo business, I entered the Oita Prefectural Bamboo Technical Training Center. Since the beginning, I have been attracted to baskets with delicate beauty and fine craftsmanship. I worked at splitting bamboo as finely as I could and designed a number of flower baskets that were light and open. The type of baskets I made were quite different from the traditional bamboo baskets of Oita, which were very ornate and heavy. In my early twenties, I showed my art pieces at regional and national competitions and won several prizes to kick off my artistic career. The exhibition pieces did not sell in Japan, so I concentrated on making new designs for flower baskets that were suited for modern houses and apartments. Fortunately, these works sold very well at Japanese department stores for ten years or so. In early 1998, Mr. Coffland, a founder and previous owner of TAI Gallery, came to visit me. He took my work to the US and placed it into the well-known bamboo art collection of Mr. Lloyd Cotsen. Ever since, I have created many art pieces and shown them through TAI Modern. I now make art pieces for the Western market and design contemporary flower baskets, which my assistants make, for the domestic Japanese market. In bamboo art, to materialize your vision you have to keep working with the medium for many years and acquire fine skills through experience. When I start a project, I have a rough idea in mind, but it really is a joint venture between the bamboo and myself. It could be a friendly partnership, or it could be a battle. Whichever the case may be, dialogue with the material and constant adjustments by the artist are essential to every part of the process. That is what makes bamboo art so interesting to me.